1. 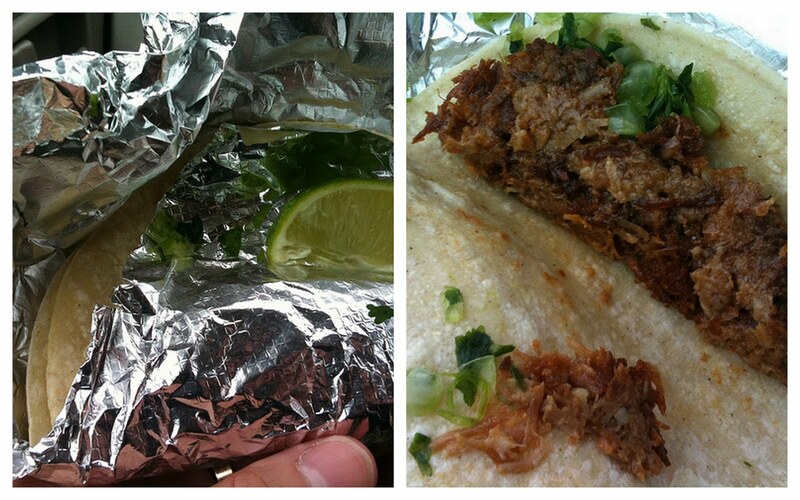 A lime actually does come with each taco. Tucked into the folds of foil, its freshness was debatable (food additives can do wonders for appearance), but it did the trick. 2. 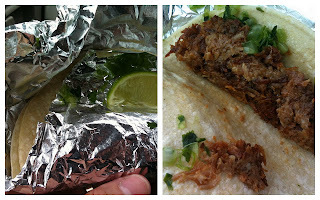 The corn tortillas, doubled up just like they do in the cantina, weren't terribly brittle. Taken at face value, however, even the best corn tortillas have little to offer in the way of flavor. 3. The cilantro bled all over the white onions, giving them an offputting greenish-brown hue like that of guacamole left out too long. The mixture was also soggy. More than the flavor of onions, I appreciate their crunch, which was lacking here. 4. The pork was mushy, and as you can see in the picture above, it looks a lot like the "beef" that's ubiquitous in the rest of their offerings. It really didn't taste too bad, though. Perhaps a grain too salty, but with sodium levels in fast food being as high as they are, it's a taste that's hard to mask. I think we paid something like $1.89 for each one. If you find yourself at Taco Bell for other reasons (Mexican Pizza, maybe), it's cheap enough for you to try, and there's no reason you shouldn't. Buen provecho. Is there a 'Burger King Pizza Burger' in your stomach's future? Why Did They Eat This?